Exclusive: Catalonia’s bid for independence from Spain had a curious twist, a readiness to take its place within the supranational European Union, a further challenge to traditional nation-states, observes Andrew Spannaus. Political debate across Europe has been shaken by the clash between the pro-independence faction in the Spanish region of Catalonia, and the national institutions of Spain, raising thorny issues about autonomy, national sovereignty and the European Union. The Catalans, who organized a referendum on independence that was formally prohibited and partially repressed by national authorities, are in fact just one of the regional groups around the continent which have consistently sought to lessen their ties with their respective national governments, with schemes that go from greater financial independence to outright secession. Until just a few decades ago, such aspirations would have barely been considered realistic in the Western world, as nation-states have been the dominant political entity for centuries, with no intention to give up power over their territory or population. Several factors have intervened to change the political environment since the beginning of the 1990s. First, there has been the promotion of the notion of ethnic self-determination by Western democracies. This has generally been used to urge political change in other areas of the world, often with geopolitical aims such as weakening strategic adversaries; there are numerous examples, from the former Soviet bloc and the Balkans, to East Timor and Tibet. Support for such breakaway movements in the name of democracy and human rights has opened the door for people in Western Europe to demand their own right to self-determination. Second, is the strategy adopted by architects of the modern European Union to encourage acceptance of the abandonment of national sovereignty. This entailed a departure from the original form of the E.U. that was begun in the 1950s as a system of economic cooperation among Western European countries with a strategic aim. In that initial phase, it was considered essential to foster a close alliance in order to counter the Soviet Union, and the United States even made increased European cooperation a condition for disbursement of Marshall Plan funds shortly after World War II. At the end of the Cold War though, the E.U. underwent a significant transformation, adopting the goal of gradually ceding national prerogatives to the supranational structures in Brussels and Frankfurt, ultimately seeking a sort of European-wide “United States of Europe.” This idea was promoted by the political elites, but garnered only limited public support, repeatedly being rejected when actual votes were taken among the population, for example. It’s not difficult to understand why: countries would have to voluntarily give up their sovereignty to a political structure that, while formally managed by representatives sent from each single area, risked being led mainly by a permanent bureaucracy with little connection to, or understanding of, the diverse populations around the continent. The impression, still present today, is that the transatlantic political and financial establishment would centralize control, catering to the needs of only a small portion of the population. This had an effect on political movements that focused on local issues. An example comes from Italy, where the idea was trumpeted by Gianfranco Miglio, an Italian jurist and political scientist who was a leading proponent of regional autonomy. Miglio was a long-time supporter of a reorganization of nations into smaller entities based on different ethnic groups, in a situation where the state and borders would ultimately disappear, as he put it. Miglio became the philosophical leader of the Italian “Northern League” for a time in the 1990s. The League began as a movement calling for secession of the wealthier regions of northern Italy from the center and south, cast as corrupt, inefficient and impossible to reform. Representatives of the League were elected to political positions throughout the North, but eventually also took on roles in the national government. As the notion of secession proved to be unrealistic, the political world did however embrace the idea of greater federalism, understood as allowing regional governments more financial and administrative autonomy, for better or for worse. Now the two largest regions of Italy’s North, Lombardy and Veneto, are poised to vote in a non-binding referendum in favor of greater autonomy on Oct. 22. The aim is not to move towards actual independence – a goal embraced by only a small portion of the population – but rather to convince the national government to allow the wealthy regions to keep more of the taxes they pay, instead of sending most of the money to Rome where it is redistributed based on national priorities. This is the position supported publicly by Lombardy Governor Roberto Maroni, who makes no bones about his desire to shift resources to his own constituents rather than keep subsidizing other areas of Italy that are less efficient and more needy. In a press conference three weeks ago, Maroni also jumped at the chance to declare his support for a “Europe of the Regions.” Despite aiming to capitalize on populist sentiment, he distanced himself from the nationalist, anti-E.U. sentiment spreading around Europe, expressed by politicians such as Marine Le Pen in France. Thus the push for local autonomy dovetails nicely with the increase of supranational power structures that weaken the nation-state. The case of Catalonia is more contentious. The Statute of Autonomy went into effect in 2006, giving the regional institutions heightened power over numerous areas, from education and health to communications and transportation. In 2010, the Constitutional Court of Spain began to roll back the effects of the Statute in various fields, provoking the opposition that ultimately led to the referendum earlier this month. Not all Catalans are for leaving Spain. Indeed recent polling suggests that there is currently not a pro-independence majority. This conclusion is disputed though, and in the regional elections of 2015 pro-independence parties received 48 percent of the vote, short of an absolute majority, but a plurality sufficient to give them control of the regional government. The result has been a clash between Catalonia and the national government of Spain, with the national police intervening physically to block the referendum on Oct. 1. The conflict has also raised serious issues for the European Union. Catalan secessionists openly stated that as an independent state they intended to be a member of the E.U. What better way to advance the notion of a “Europe of Regions”? When push came to shove though, the E.U. institutions found themselves forced to warn Catalonia that it would not receive any preferential treatment even if it were to become independent. After an initial embarrassed silence, the European Commission aligned itself squarely with the position of the Spanish government, showing that in times of crisis the prerogatives of nation-states still prevail. It’s ironic that just as voters throughout the West are supporting populists calling for a return to national sovereignty, in opposition to the end of political and economic borders as preached by globalization, the other flank used to weaken nation-states, that of regional autonomy and self-determination, is now causing problems precisely for those who promoted it. 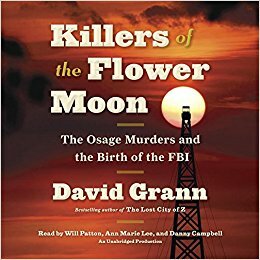 But there were also more local strategies, hatched by greedy operatives and enforced by targeted killings, such as the murders of Osage Indians at the heart of a new book by David Grann, Killers of the Flower Moon. The Osage Indian nation dated back to well before the formation of the United States, when the Osage roamed through what are now four states (Kansas, Missouri, Arkansas and Oklahoma). After the Louisiana Purchase in 1803 when the new U.S. government “bought” vast tracts of territory west of the Mississippi River from France and after a series of negotiations, the Osage ceded 52 million acres in return for the U.S. government’s protection from other tribes. But the Osage had more to fear from the white men. In 1870, the Osage were ultimately pushed onto their final destination, the north central portion of Oklahoma, where they lived by subsistence farming and by leasing land to ranchers for grazing. Under the agreement negotiated by Chief James Bigheart, the land was owned by the Osage though administered by the U.S. government. Bigheart also negotiated a deal in which the Osage maintained mineral rights to their land. That proved important because oil was discovered in Osage County making the tribe relatively wealthy due to a system called headrights. This meant that each tribe member would be allotted royalties from both the sale of the oil leases and also for a percentage of the extracted petroleum. Since some of the bidders on the leases were people like Frank Phillips, George Getty and Frank Sinclair, the auctions on some leases would begin at $500,000 and end at over $1 million. In 1923, in just one day, $14 million in oil leases were sold: over $200 million in today’s dollars. This wealth helped transform Osage territory; with the main villages — Fairfax, Hominy, and Pawhuska – becoming the equivalent of Western boomtowns. Horses and wagons were replaced by Model T Fords; one-level wooden frame stores gave way to five-story brick office buildings; telegraph offices were replaced by blocks and blocks of telephone poles and wires. Therefore, in 1921, not only were the Osage limited by needing approval from their guardians for expenditures, but limits were placed on how much they could annually withdraw from their trust fund. Practical exceptions like having medical bills or wanting to send children to private colleges did not matter. As one can imagine, this guardian system also provided ample opportunities for embezzlement of the Osage “trust” funds. The second method that the local power structure utilized to control the Osage wealth was exercised through a legal loophole. That loophole specified that the Osage trust funds could be passed on through family inheritance. What this meant was that if an Osage woman married someone outside the tribe, her husband could inherit her wealth. But there was even a more sinister side to these arrangements. Osage women started disappearing and people who dared investigate started turning up dead. After eliminating local outlaws and her former husband as suspects, the local Justice of the Peace closed the case in July 1921. He concluded that both Anna Brown and Charles Whitehorn had died at “the hands of parties unknown.” (ibid, p. 35) That same month, Mollie’s mother Lizzie also passed away. Bill Smith, Mollie’s brother-in-law, became convinced Lizzie had been poisoned. With the death toll climbing, but the public and private inquiries yielding meager results, the Osage turned to Barney McBride, a wealthy white oil man whom they trusted and who was genuinely sympathetic to Indian affairs. He knew several people in Washington who might help. But the killing spree only got worse. A spectacular explosion tore through the house of Mollie Burkhart’s sister and brother-in-law, Rita and Bill Smith, the man who had voiced his certainty that Mollie’s mother Lizzie had been poisoned. Rita Smith and a maid Nettie Berkshire died in the blast and Bill Smith died four days later. But Vaughn never arrived in Pawhuska to meet with the sheriff. He was dragged from his Pullman car and his is body was found 36 hours later with his neck broken. Whatever notes he took concerning his interview with Bigheart had disappeared. With Vaughn’s death, the official number of murders in the Osage case rose to 24. The local and state authorities seemed powerless to stop it. Whoever was running the plot seemed beyond the reach of the law. In the summer of 1925, the head of Washington’s Bureau of Investigation decided it was time to intervene in a serious way. One of the functions of the Bureau, which had not yet been named the FBI, was to investigate crimes on Indian reservations. The director was 29-year-old J. Edgar Hoover, who knew his position was tenuous. Hoover decided the only way to prevent more bad publicity was to call in a law enforcement acquaintance from the area and give him the power he needed to crack the case. The man Hoover called upon was Tom White, a Texas Ranger for 12 years before joining the Bureau in 1917. Hoover offered White the stewardship of the Oklahoma City office and the freedom to select his own task force. Hoover made a good choice and was wise to give White the independence he needed. White decided to pursue the conspiracy on two levels. He would stay in Oklahoma City as the public face of the inquiry. From there, he and his chief assistants – most notably John Burger – would review the files that had accumulated from all law enforcement agencies over the last four years. Secretly, White would employ a team of undercover agents who would slowly flow into the Osage area seeking to make friends and to find leads. One of these agents was John Wren, a Ute Indian. That document led White to uncover a massive system of graft and embezzlement, involving as much as $8 million stolen from the Osage through the guardian system (or about $112 million in today’s dollars). White also discovered another curious aspect of the Hale/Roan relationship. Hale had unsuccessfully tried to purchase Roan’s mineral headrights. But the attempt led White to another lead. While studying the record of the murders, and the scam that Dr. Shoun had pulled on Smith before his death, White concluded that, with Mollie Burkhart’s relatives dying off one by one, more and more headrights were ending up with Mollie, who was married to Ernest Burkhart, Hale’s nephew. The case was broken when White went back into the files and discovered an informant named Blackie Thompson, who was half Cherokee. He told White that Ernest Burkhart and William Hale had tried to enlist him in the Smith bombing, but he was arrested for theft before the bombing was carried out. White confronted Burkhart with Thompson’s sworn affidavit. When Burkhart still denied it, he had Thompson enter the room to endorse the document. Burkhart then admitted his role, saying that when he expressed reservations about the bombing, Hale said to him, “What do you care. Your wife will get the money.” (ibid, p. 190) Burkhart also revealed the names of the killers who Hale had recruited to murder Henry Roan and Anna Brown. Hale did everything to escape justice. He attempted to influence the grand jury, he tried to have his case moved out of federal court and into state court. He even hired an assassin to murder a key witness. But White heard about it before it could occur and confronted the accused assassin. Hale and three accomplices were eventually convicted. Shortly after Hale went to jail, White retired from the Bureau and became a prison warden. Hoover closed the case. But that meant the public never discovered who stabbed Barney McBride in Washington and who threw W. W. Vaughn from that Oklahoma City train. Grann looked up Vaughn’s surviving descendants and was told that Vaughn’s family was threatened not to pursue the matter any further. (ibid, p. 259) But they did, and information was passed on from one generation to another. Their major suspect was a local banker named H. G. Burt, who tried to embezzle money from Vaughn’s estate and was later sued by his widow.